If your children love to play games as much as my children then you are going to want to check out the exciting new line-up of children’s games from Wonder Forge. If you have a Disney, Batman or Dr. Seuss fan then these games are sure to be a hit for the lucky recipient this holiday season! 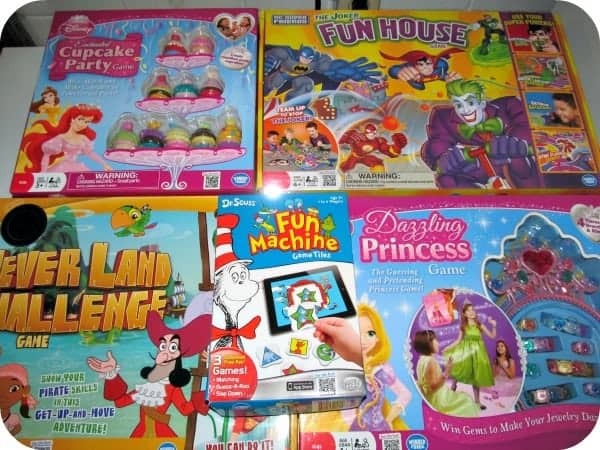 There are six fun and entertaining games available from Wonder Forge including Jake and the Never Land Pirates Never Land Challenge Game, Jake and the Never Land Pirates Who Shook Hook Game, Disney Princess Enchanted Cupcake Party, Disney Princess Dazzle Princess Game, Dr. Seuss Fun Machine App-Play Game and Joker Fun House Game. One of our favorite games is the Jake and the Never Land Pirates Who Shook Hook Game which is an adventure play game that had my children engaged from the first game play. How does it work? Captain Hook is set on his hammock surrounded by his “treasures”. 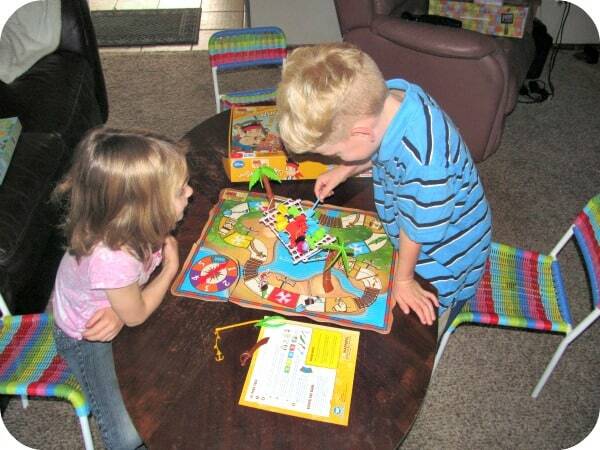 Children place their player on the game board and follow the instructions on the game cards as they try to remove pieces of Captain Hook’s treasure from the hammock without him falling off. Whoever has the most treasure at the end of the game (when Hook falls off the hammock) is the winner. Watch out for the hungry crocodile under the hammock who likes to eat treasure……!! I appreciate that this game is fun but educational too as it promotes dexterity. The Dr. Seuss Fun Machine App-Play Game ($9.99) is creative and unique because it features a tabletop game with an app that works for iPad, iPhone or iPod touch. Kids will have fun making match-up and I like that the tiles are very sturdy to withstand little hands. My youngest children love playing match style games and I appreciate that it promotes skills such as observation and deduction while using their memory to match up the colorful, zany tiles. Wonder Forge games are high quality, fun and attractively priced in a variety of price points. You are invited to visit the website to browse the entire selection of new games and find a purchasing location near you or at an online retailer……..which one would your children love to open up this year?! Yes my son does! He loves playing board games. He’s an only child, so me and my husband like to try to take the time to play them with him when we can. A lot of the games he has encourage him to count, sort etc so they are great games to play. My son loves Dr Suess so I think he would love to play the Fun Machine game. Thanks for the review! I would love to play this game with my son, I think he would enjoy it too. What fun games! I love that they have all of my daughter’s favorite characters. We are a big Gamer family – these look great! I’ve never heard of this company before. Thanks for sharing!